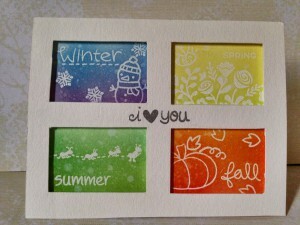 Extra Details: I began this card by creating my frame. 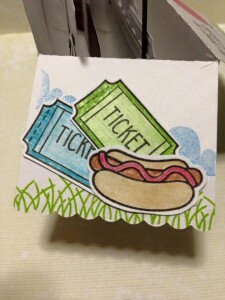 I used the stitched rectangle dies from Lawn Fawn’s Scalloped Box Card Pop Up. I cute them from two panels of white card stock and two panels of Kraft card stock. 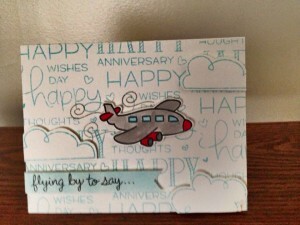 I stamped one layer of the Kraft card stock with Versa Mark ink and a wood grain backdrop. I glued all of the frames together and set them aside to dry. I used the stitched rectangles from one of the white panels to stamp my scenes on. Anything that needed to be colored in, I used Prismacolor pencils on. Using my frame as a guide, I adhered the panels to a white card base. I also adhered the frames. 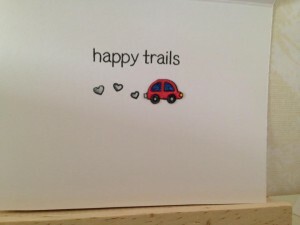 While everything was drying, I stamped the cars and banner on a separate piece of white card stock. Again, I used Prismacolor pencils to color them in. I fussy cut them out right on the black line. I painted the edges black to hide any cutting errors. I added the cars to my scenes using foam dots. I added another sentiment to the inside of the card. I had a small car left over, so I adhered that also. Overall, I really like this card. 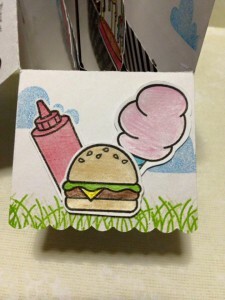 This card was inspired by the current Simon Says Stamp Monday Challenge: Let’s Doodle. 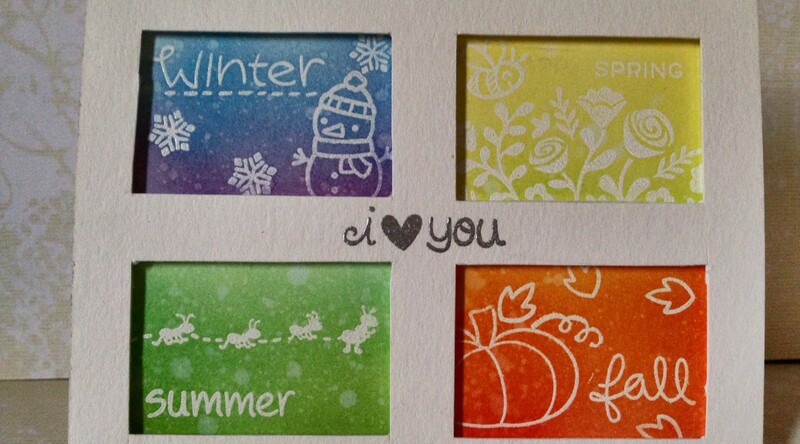 I do not like my own doodling but I love the look of Simon Says Stamp’s Fingerprint Doodles stamps. 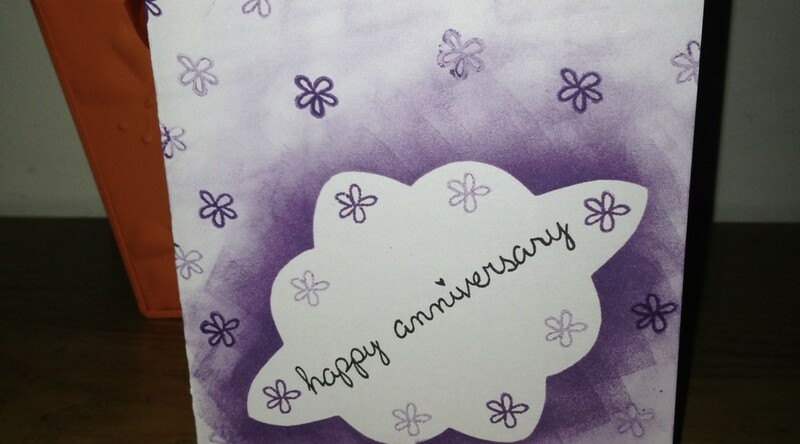 I added the anniversary sentiment on the inside so I could send it to friends who are celebrating their anniversary. Extra Details: I began this card by die cutting a cross stitched rectangle from some smooth white card stock. I stamped the two of the fingerprint stamps in colored inks. I added the doodles on top with black ink. Using the same ink, I added the sentiment. 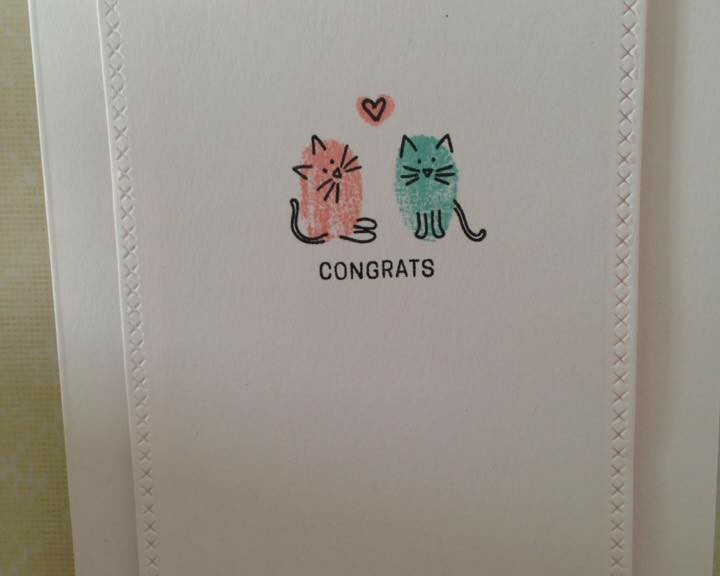 I choose the small sentiment so the card would be super clean and simple. I added a small peach heart between the cats. I used a Sharpie Pen to doodle my own heart on the colored heart. I adhered this panel to the card front with some foam tape. 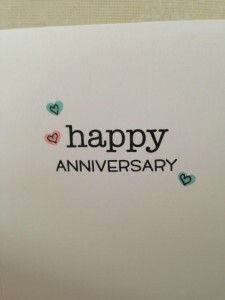 I added the happy anniversary sentiment to the inside of the card with a trio of colored hearts. I drew my own black hearts on these also. My husband and I just celebrate our dating anniversary. This is the card I made him. I LOVE the way it turned out. Extra Details: I began this card by making a card base from some dark blue card stock. Using a white pigment ink and a starry backdrop stamp, I added stars to the front and all over the inside. I used the same card stock to die cut the pieces for the Pivot Pop Up. I added the starts to the panels as well. I masked off the area where the heart constellation was going to go. While I had my die cutting machine out, I also die cut some green card stock with a grassy border die. In the end, I used two layers for the front, each side of the card and the Pivot Pop Up panel. 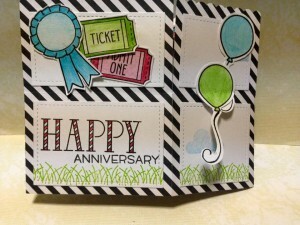 I used white embossing powder to add the sentiments to two of the grass layers. I also added the heart constellation to the Pivot Pop Up panel. Using scrap of the blue card stock, I embossed the shooting star. 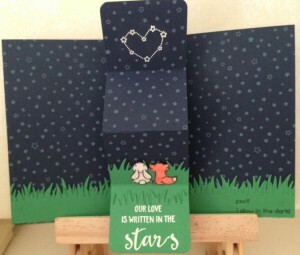 I added glow in the dark embossing powder to the shooting star and the heart constellation. On a separate piece of white card stock, I stamp both the small and large critters. I colored them with Prismacolor pencils and fussy cut them out right on the black line. I used a black marker to paint the edges of the images to hide any cutting errors. I also fussy cut out the shooting star. Then I began adhering everything together. 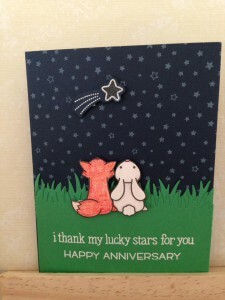 I used foam dots on the large critters and shooting star on the front of the card. I used liquid glue or double sided tape for everything else. Lastly, I added the “I glow in the dark” sentiment to the inside of the card. A friend asked me to make and anniversary card. The happy couple enjoys traveling; I took that idea and ran with it. 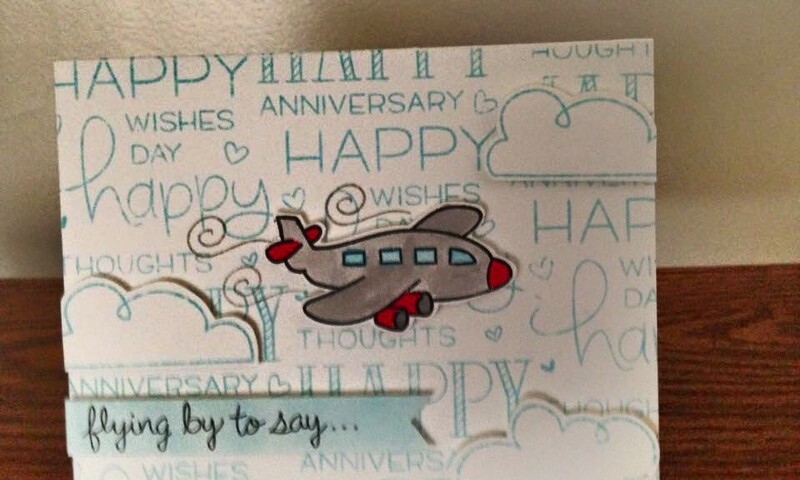 Extra Details: I began by stamping and water coloring the plane and the clouds. I used Distress Inks to add the color to the plane. While those were drying I began work on my card base. 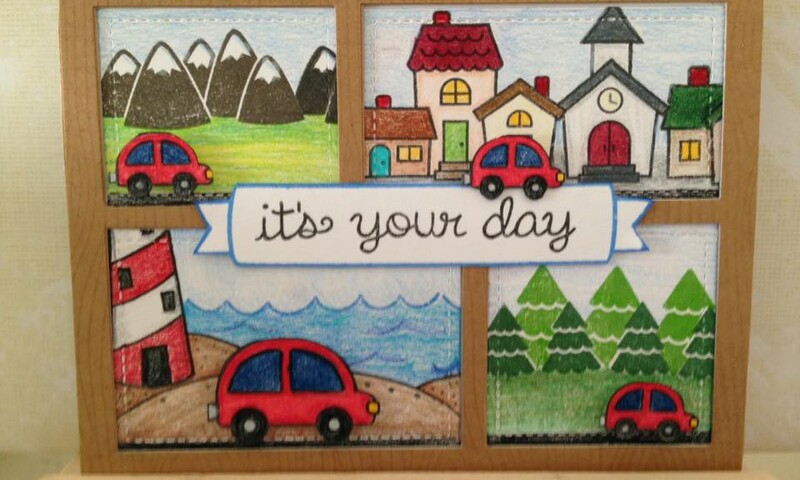 I used Lawn Fawn’s Happy Happy Happy stamp set to create a background. I created a block of text on my acrylic block and stamped it repeatedly on my card front using a lighter blue ink. 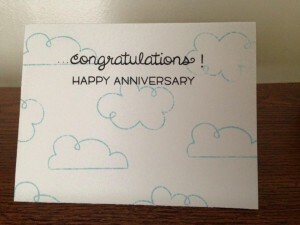 I added clouds using the same ink on the inside of the card. I also added the sentiment in black ink. Once the images were dry, I fussy cut them out leaving a small white border. I adhered them to the card front with foam tape. For the sentiment, I cut a small strip of water color paper and ink blended some blue ink on it. I also adhered that with foam tape. I have been thinking about this card design since the Pop Up Box Card Die arrived. I was finally able to get the idea out of my head today! 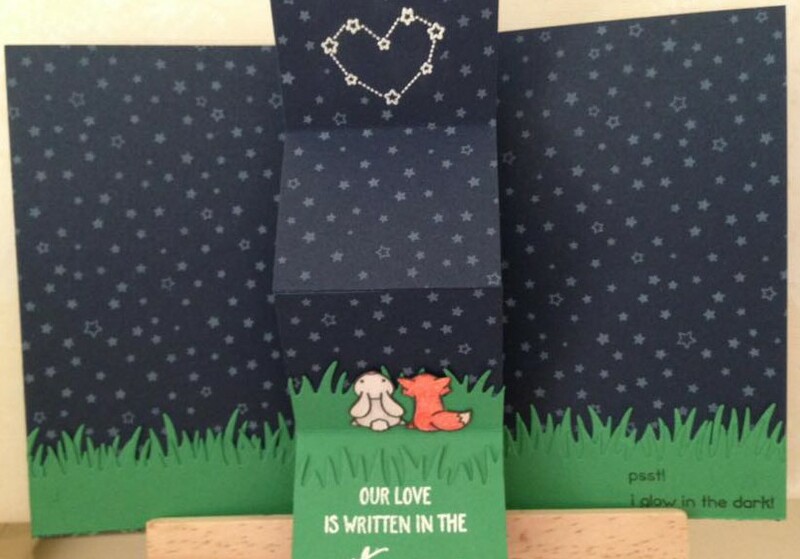 Extra Details: I began by die cutting; lots of die cutting. I cut the card base and braces from some black and white striped paper. I cut the stitched white rectangles from white card stock. The poles and banners were cut from two shades of gray card stock. The banners and one brace was die cut from some black and white text paper. 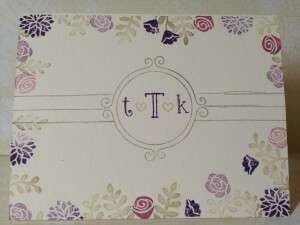 I find with this style of card that it is easiest to decorate everything before actually putting the box together. With this in mind, I began stamping next. I added grass to white rectangles that would be on the bottom and the three flaps that will fold down when the card is open. I added some clouds and a sun with colored inks. 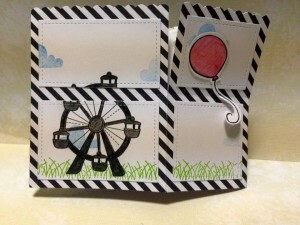 Using black ink, I added the sentiments, a balloon, and the Ferris wheel. 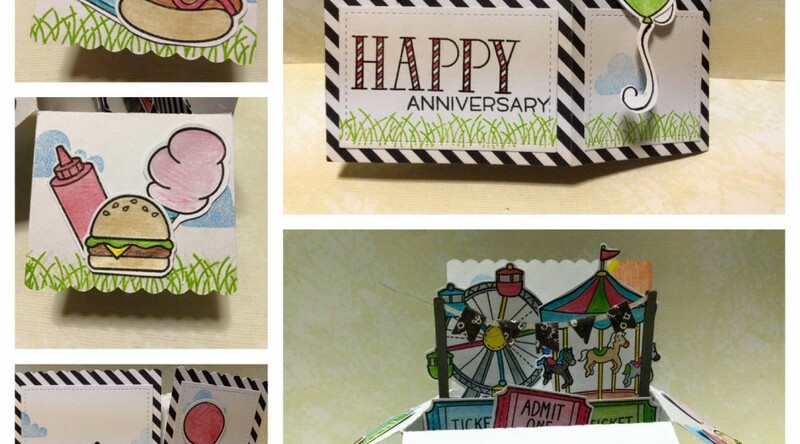 On a separate piece of white card stock, I stamped another Ferris wheel, a carousal, tickets, balloons, cotton candy, hot dog, burger, ketchup, and ribbon. I used colored pencils to color in all of the images on this sheet and on the pieces of the card base. Once, I was done coloring, I fussy cut everything out. I left a small white border around all of the images. Then, I began assembling everything. I used strong double sided tape wherever possible and liquid adhesive on the smallest pieces, like the banner. I love this card and it turned out way better than I imagined in my head. One of my co- workers needed a card for a seventieth anniversary. I had a lot of fun creating this card for her. 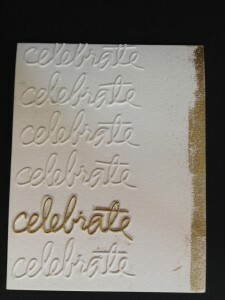 Extra Details: I started by die cutting the word celebrate seven times from water color paper. I coated one die cut in Versa Mark ink and covered it with gold embossing powder. 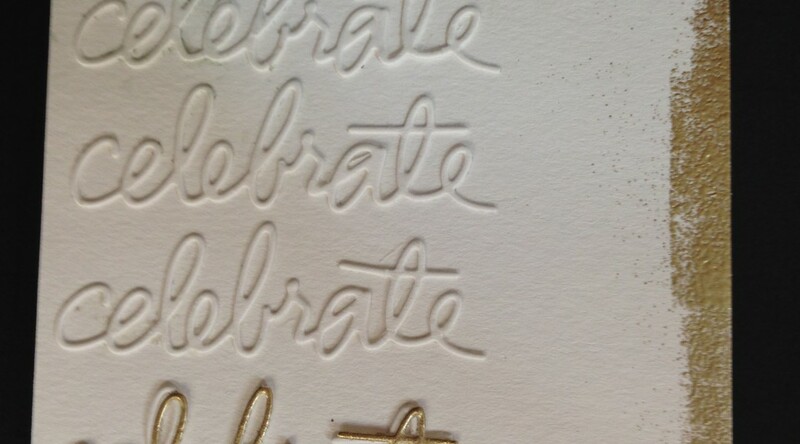 After heat setting the embossing power, I allowed it to cool while I worked on the rest of the card. I glued the rest of the die cuts to the front of the card base. 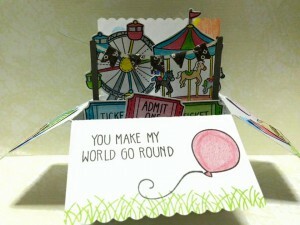 I was having trouble keeping the glue on the very delicate die cuts; I will have to try something different next time. I glued the gold die cut right on top of one of the white die cuts. Then I smooshed some Versa Mark ink on the right edge of the card front. I added some more gold embossing powder. To soften the edge of the embossing powder, I used a dry paint brush to brush some of the embossing powder off of the edge. 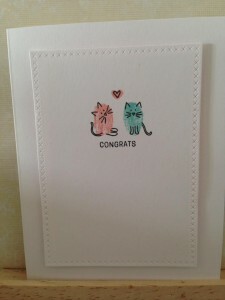 Lastly, I heat set that embossing powder and the card was done. This is the anniversary card I made for my husband. Our anniversary may only come once a year, but I love him all year long and wanted to let him know. Extra Details: I started by making the top layer of this panel. Using a ruler, pencil and my paper trimmer, I cut four windows in a panel of water color paper. I silver embossing the sentiment on this panel. I used the window panel to lightly trace the windows on the card base. Using the pencil lines as a guide, I stamped and white embossed various images in each window. I used Post-It tape to help mask areas that the stamps would have overlapped. Once the embossing was cooled, I began ink blending in each area. I also used Post-It tape to help contain the color to only one window area. I used two Distress Ink colors in each area. I flicked some water on the card base to add interest. Lastly, I popped the window panel up on fun foam and adhered it to the card base. 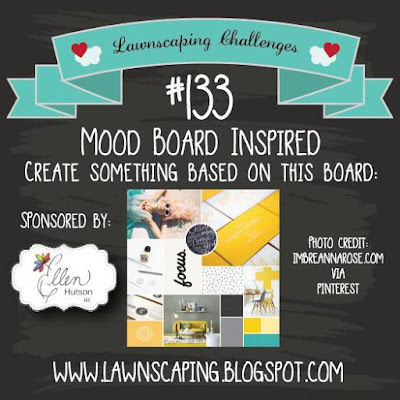 I am entering this card in the Lawnscaping Challenge #133: Mood Board Inspired. I saw all the monograms on this mood board and wanted to do something with a monogram. I ended up making two cards. I used the color combination from the mood board on one of the cards. 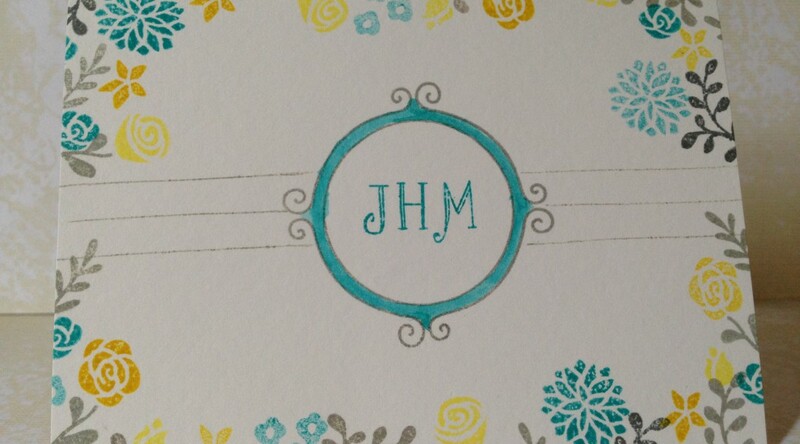 The other is a first anniversary card, so I used the colors from the happy couple’s wedding instead. Extra Details: Both cards are one layer cards, so I started by creating my card bases out of white card stock. 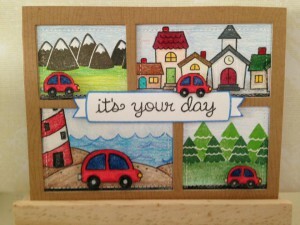 I stamped the frame in a light grey ink in the middle of both card bases. I stamped the lines on the side also in light grey ink. Obviously, one set of lines worked out better than the other set. I added the monograms in the center of the frame. The T on the purple/green card is from the large THANKS in the A Good Apple stamp set. 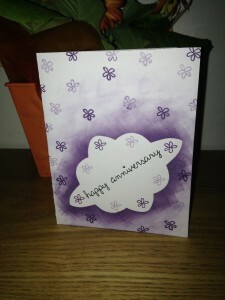 I added hearts to the purple/green card as this is the first anniversary card. 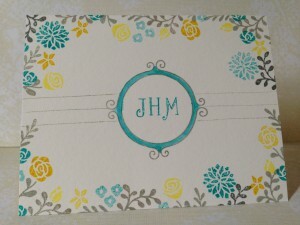 Then I started added flowers and leaves all around the edge of the card front. One the blue/yellow card I used the same blue ink to water color the frame in for added interest. Oh my first attempt at ink blending. I only owned one color of distress ink, no ink blending tools, no dies, and only post it notes to use as masking paper. Extra Details: I had cut a mask using post it notes. I used a makeup sponge to blend my ink. I did some first and second generation stamping for the flowers in the background.